Swan won't deliver his surplus, and neither will Wells, says Gavin R. Putland. As the ABS has recently updated “Taxation Revenue, Australia” (ABS 5506.0), I can update the post of Sep.17. In so doing, I have extended the national graph back to 1999, added a curve for gambling taxes, and produced a separate graph for Victoria. In each graph, the colour codes in the legend are in the same order as on the right-hand edge of the plot. As Mr Swan attempts to balance the Federal budget, his biggest revenue problem is company tax, whose revenue yield plunged $11 billion between 2007-8 and 2009-10 (see the graph below). In 2010-11 the yield had not climbed a third of the way back to the nominal pre-GFC level — let alone returned to trend. Perhaps Mr Swan's second-biggest revenue problem is income tax from superannuation funds, whose yield fell about $6 billion between 2007-8 and 2009-10. 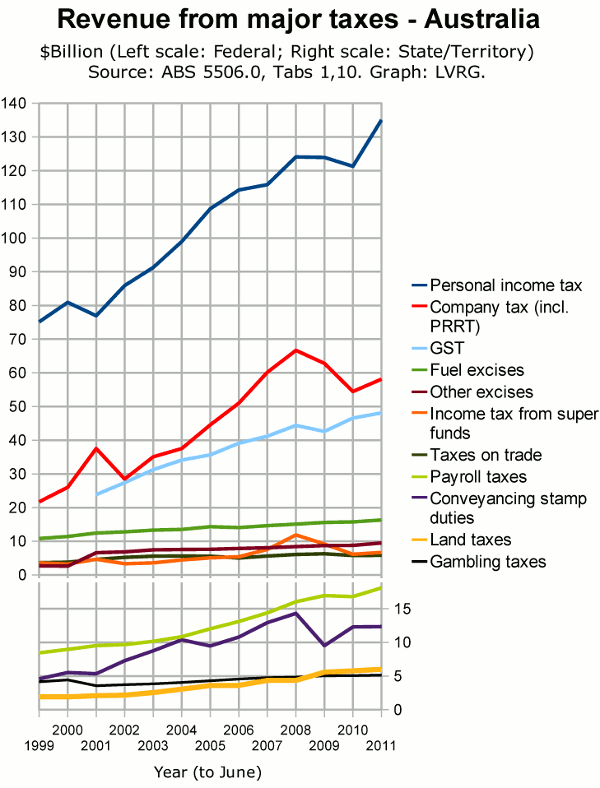 Revenue from personal income tax declined less and recovered more strongly. Revenue from company tax is volatile because the tax base is the difference between gross income and expenses, and a small fractional change in either will cause a larger fractional change in the difference. When companies make losses, the loss of tax revenue is prolonged because losses are carried forward against later profits. Mr Swan is proposing to redistribute the tax effect by allowing loss-making companies to claim refunds of tax paid on earlier years' profits. Income tax from superannuation funds is volatile as the taxable income depends on the profitability of companies in which the funds invest. Concerning the direction of profitability, one might consider the three AIG indices for April, which David Llewellyn-Smith describes as “indicative of strong recession”. The various indirect taxes — GST, excises and tariffs — were the most reliable of the taxes imposed at Federal level. The major indirect tax imposed by the States, namely payroll tax, was similarly reliable, but differs from other indirect taxes in that it has no apparent rationale except to raise revenue. Unlike the GST, it counteracts Federal tariffs by taxing the labour content of locally-produced goods but not of imported goods. Of the revenue sources normally classified as direct taxes, the most reliable in terms of national aggregate revenue was land tax, which was imposed at State/Territory level. The most unreliable State/Territory tax was conveyancing stamp duty, whose nationwide yield dropped by almost a third in the “GFC” and only partly recovered under the influence of the Federally-funded First Home Owners' Boost and its State-funded supplements. Concerning the future of stamp-duty receipts, one might consider the GFC-like levels of mortgage lending and house/unit sales. Last time the rate of dutiable transactions fell so low, it was turned around by the Federal First Home Owners' Boost, assisted by Victoria's First Home Bonus. This time around, Canberra is promising austerity while Victoria is about to end the Bonus. 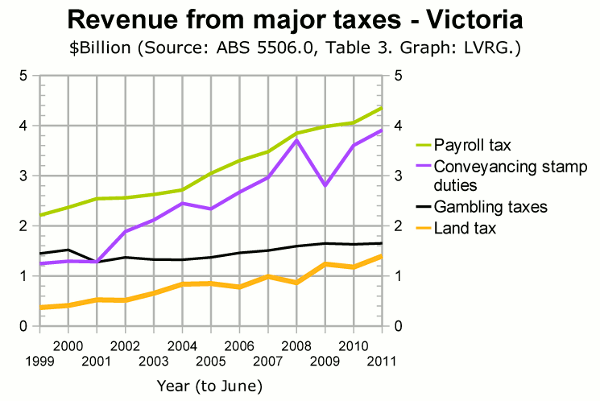 Speaking of Victoria, where Treasurer Kim Wells is predicting a surplus for 2012-13, the following graph shows the revenue from the big four State taxes for Victoria alone, with a time line ending at June 2011. For the latest trend in Victorian stamp-duty receipts, see the recent graph of Victorian home transfers offered by Leith van Onselen (free subscription required). Falling turnover in the property market is not only the direct cause of falling revenue from stamp duty, but also a leading indicator of falling activity in the “real” economy, hence lower revenue from Federal taxes.